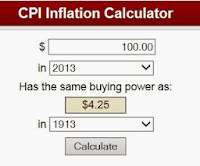 The inflation calculator at a federal government's site (real "federal", not Federal Reserve "federal" which is the same as Federal Express; and real "government" as evidenced by the domain extension ".gov" instead of Federal Reserve banks' websites that end in ".org") shows the value of US dollar has dropped by 96% in 100 years since the Federal Reserve was created. "This [Federal Reserve Act] establishes the most gigantic trust on earth. When the President Woodrow Wilson signs this bill, the invisible government of the monetary power will be legalized....the worst legislative crime of the ages is perpetrated by this banking and currency bill." "The Aldrich Plan is the Wall Street Plan. It means another panic, if necessary, to intimidate the people. Aldrich, paid by the government to represent the people, proposes a plan for the trusts instead." "To cause high prices, all the Federal Reserve Board will do will be to lower the rediscount rate..., producing an expansion of credit and a rising stock market; then when ... business men are adjusted to these conditions, it can check ... prosperity in mid career by arbitrarily raising the rate of interest. It can cause the pendulum of a rising and falling market to swing gently back and forth by slight changes in the discount rate, or cause violent fluctuations by a greater rate variation and in either case it will possess inside information as to financial conditions and advance knowledge of the coming change, either up or down. This is the strangest, most dangerous advantage ever placed in the hands of a special privilege class by any Government that ever existed. The system is private, conducted for the sole purpose of obtaining the greatest possible profits from the use of other people's money. They know in advance when to create panics to their advantage, They also know when to stop panic. 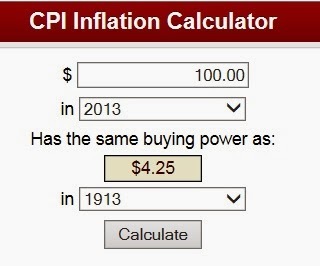 Inflation and deflation work equally well for them when they control finance." Well, we'll see about their ability to "stop panic" going forward, after their balance sheet exceeds $4 trillion dollars. Not to mention the revolving door situation related to mixing careers in large private financial institutions and public institutions (be it FRB or BCE).